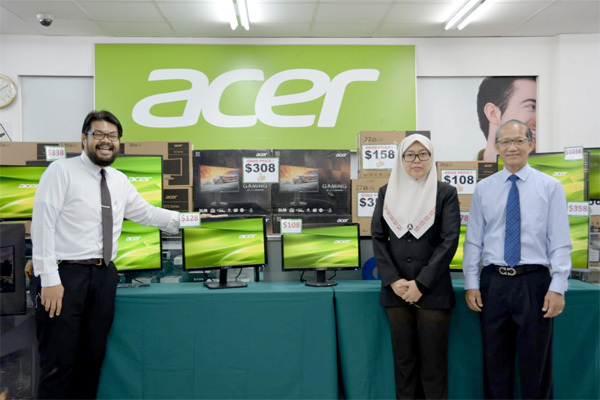 Concepts Computer, with the support of Acer, will be expanding their range of Acer monitors to encompass all users from basic everyday office work to specific gaming or graphic-intensive use. With Acer, the keywords for ensuring they meet the needs of customers are Quality and Affordability, which is why Concepts will be offering monitors from $108 for basic 19.5 inch monitors to $338 for 31.5 inch curved, graphics-capable monitors and even all the way up to $1,398 for high-end gaming needs. First on offer will be the Acer K202HQL HDMI monitors, entry level monitors perfect for use in offices especially when it comes to equipping multiple PC at cost-effective prices. These affordable display-solutions offers hassle-free usability, as easy as plug and play, and small footprint as to be space-saving. The Acer K202HQL will come with free HDMI cable and will only cost $108. Next on offer is the Acer ET322QR, a curved flat-panel monitor which is perfect for watching movies or even working on graphic media especially because of the clear and vibrant colours it can produce. With the integrated Flicker-less technology and BlueLight shield, the Acer ET322QR will be easy on the users eyes so as to be optimal for long use. The Acer ET322QR will be available for $338 and comes with 3 years warranty. Lastly, Concepts Computer will be also be introducing the latest iteration of their highly praised 34 inch gaming monitor, the Acer Predator X34P will be available for $1,398 and will be Nvidia G-Sync ready. The Acer Predator X34P has been made curvier, so as to increase the wrap-around effect, making the gaming experience more immersive. With premium styles and materials, the Acer Predator X34P will be the perfect ultra-wide G-synccapable gaming monitor for many Bruneian gamers. For more information on Acer monitors or any other products and services, please call 2233551, 2233552 or 2233553 or visit your nearest Concepts Computer showroom.